I love carnivorous plants. I grow hundreds of them at home, and have been lucky enough to travel to different states and countries to see them growing in the wild. My plants are a huge source of inspiration for me, and now that the weather is shifting, my little carnivores are sending up hungry green shoots. 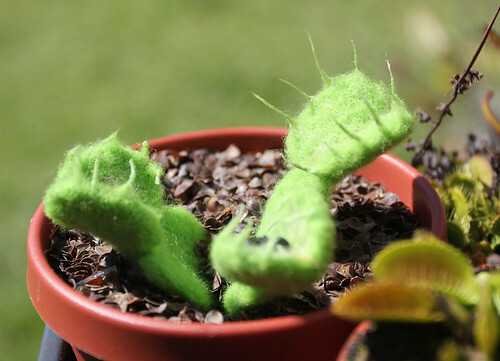 To celebrate the re-newed life in my man-eating garden, I needle-felted a Venus Fly Trap over the weekend. I started by making the traps first. I added a stem to each trap, and after making the three individual leaves, I connected them at the base. I added the “fingers” by twisting wool roving into some white glue, and then attaching it to the trap with my needle. I placed my Fly Trap in a plastic pot filled with tissue, and topped it off with a scoop of buckwheat hulls. My Fly Trap looked happy. Hungry, but happy. Luckily, a plastic ant came out of nowhere and was caught in the blink of an eye! Since the sun is out, and the sky is clear, I’ll be in the garden re-potting, trimming, weeding, and tending to my real carnivorous plants today. To see some photos of my collection, check out my set on flickr. Have a great day! Oh and, for more carnivorous crafts, check out my friend Holly who has been making some really cool paper plants over at The Lemon Grove this week. I love it and must share with my facebook friends. Great Job! Love this! 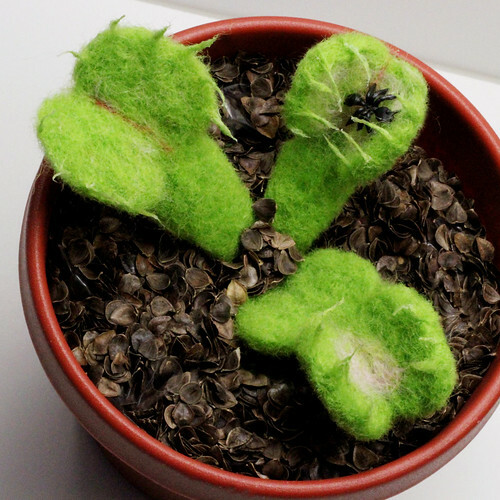 I really want to make one for my friend who tried to grow a venus fly trap, but failed miserably. She would love this!! These a fantastic. 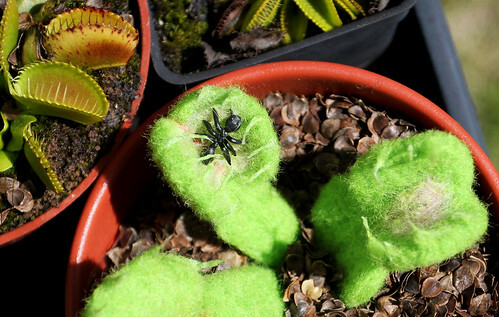 I think I am more impressed that you can keep real carniverous plants alive though – I’ve never been able to do that, but usually because I’m always trying to force feed them flies. This is definitely a fly trap I could keep alive! 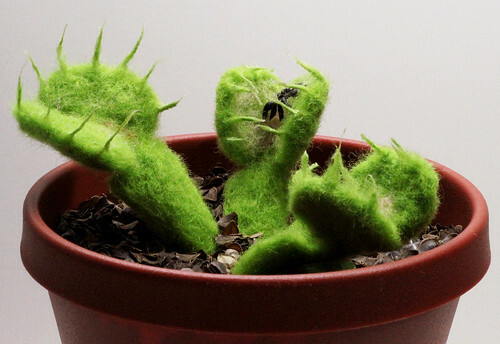 It is really adorable and well felted. I am thinking of attempting to try my luck with another carnivorous plant though. Any suggestions of what to pick would be welcome!